Combine mayonnaise, salad dressing, salt, and pepper in a large bowl. 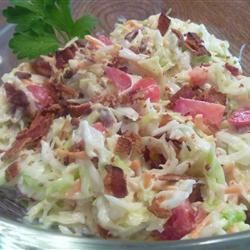 Stir in the coleslaw mix and bacon. Add the tomatoes, and toss gently. Cover, and refrigerate for 1 hour or overnight before serving. Do you have a favorite recipe you take to family outings and picnic’s? I would love to feature you for a New Food Friday post.